A flickr contact, davidteter, recently posted the above to his photo stream on that service. 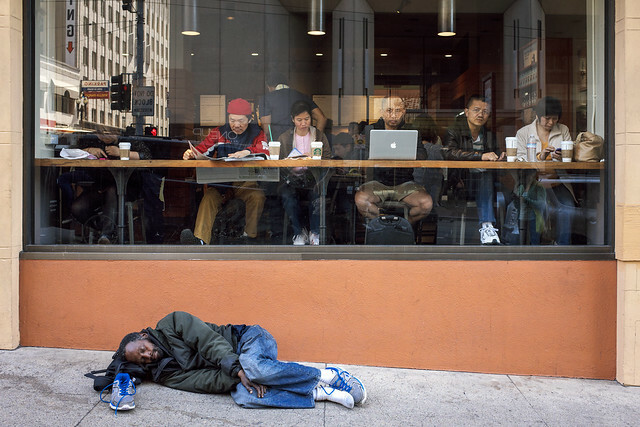 It depicts a person sleeping, head on top of his backpack, in front of the large glass windows of a coffee shop. He is wearing one of his running shoes with bright blue laces and the other is off and sitting in front of his head. The window of the coffee shop is filled with people, apparently unconcerned that a person is passed out on the street, just below their field of vision. I am profoundly ambivalent about capturing candid photos of the large population of persons who seem to be, temporarily or permanently, living on the streets of the city of San Francisco. Historically, there is a precendent. Paul Strand had a special camera made, which allowed him to take a picture of something/someone, while appearing to photograph something else. Dorothea Lange’s portraits during the depression and dust bowl were rallying points for social justice. I take BART and MUNI daily and walk around this city. Just this morning I passed a homeless person’s “nest”, leaking urine, being cleaned up at the Civic Center MUNI platform AND witnessed a drunk, disorderly, and abusive person being removed from the N train. Did I stop and take a picture of either? No. First off, when on public transit, I am generally in non-communicative mode. I am afraid, by taking a picture, I will engage a person and risk an interaction. In my experience, the vast majority of interactions on public transit are pleasant, but the ones which are unpleasant are SO unpleasant, (risk of being beat up, robbed, threatened, yelled at, or worse,) that I try to avoid all interactions, unless someone is apparently lost or genuinely in need of help. That either makes me a coward or a savvy city dweller. I am uncertain of the protocol. Do I ask before taking a photo? What if they want money? If so, what’s an appropriate amount? Also, really, I am not much of a people photographer. I know people who are good at getting people to look their best, or in a certain way, for photos. I don’t really enjoy that sort of interaction. My whole photographer thing, what I enjoy, is capturing a moment as it happens, the way light is falling on a leaf or a face, not ME creating a moment for a photograph. I tend to be kind of stickler-ey about not even moving the subjects of my photography. Camera can move, but the thing is where it is. Finally, I am not really comfortable exploiting others’ misfortune for my own gain, even if it is just internet kudos. Both Lange and Strand were attempting to expose something that was not being seen by the larger public, idealistically you could say, for social justice, although, Lange for profit, Strand certainly not. I am as ambivalent about the homeless situation in San Francisco as I am about taking pictures of it. A person could spend all day, every day, taking pictures of the wasting expressions and faces of the youth in the upper haight and Golden Gate Park. It is tragic and heartbreaking. On the other hand, those people often REALLY annoy me with their intentionally comical requests for money and offers of “bud”.